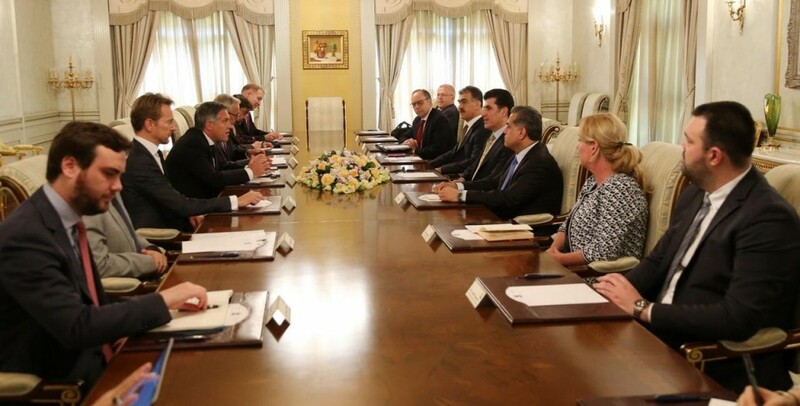 Kurdistan Regional Government Prime Minister Nechirvan Barzani met with a delegation of representatives of the European Union countries in Iraq and the Kurdistan Region. Mr. Patrick Simonnet, the head of the delegation and the EU Ambassador to Iraq, briefed the Prime Minister on the latest meeting of EU foreign ministers. The representatives commended the Kurdistan Region for its role in the fight against terror and the sacrifices made by the Kurdistan military forces, the Peshmergas, in defending the free world. Regarding the independence referendum, scheduled for 25th of September, the European diplomats called for serious dialogue between Erbil and Baghdad. Prime Minister Barzani thanked the European Union countries for their support to the Kurdistan Region in the fight against terror. Mr. Barzani also reiteratd his position that Erbil and Baghdad need to engage in a serious dialogue on their future relations and standing disputes. The leader of the Kurdistan Regional Government also said that the people of Kurdistan have the right and want to determine their own future through the referendum. He said that the referendum will not have a negative impact on the Kurdistan Region’s fight against terror, adding that Kurdistan will continue to defeat and uproot the so-called Islamic State terrorist organization.